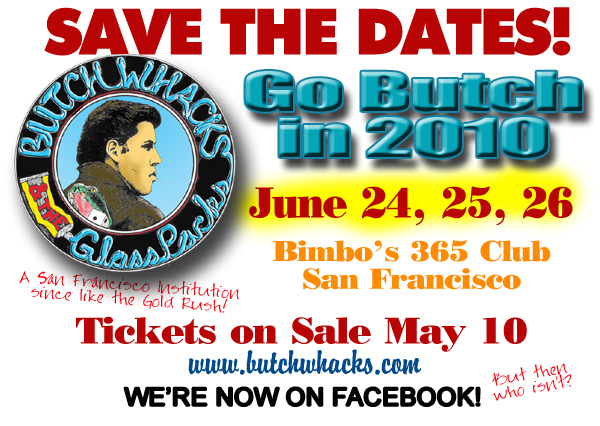 Despite popular demand, Butch Whacks rides again in 2010 - June 24-26 at Bimbo's in SF! You asked for it, and now you got it -- so don't blame us! Yes, Butch Whacks and the Glass Packs -- as much a San Francisco institution as tailgate parties at Candlestick or innocent late-night strolls in the Tenderloin -- will return for yet another farewell performance -- their 28th, we think* -- once again at historic Bimbo's 365 Club in beautiful, downtown North Beach. The dates are June 24, 25 and 26. We may be another year older, and the joints and muscles may not be a as supple and spry as they once were, but we've loaded up on Ben-gay, glucosamine supplements and WD-40 -- and we are ready to do yet another more than reasonable facsimile of knocking your socks off. Buy them in person and proudly show the world what a rugged traditionalist you are. 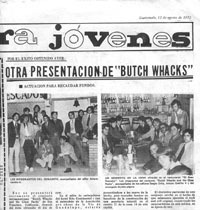 And as always, remember to check www.butchwhacks.com for the latest info and updates. * at least we think it's the 28th. We started this reunion gig back in 1983, but do you count the year or two when the dementia flared up and we forgot to show up? Learn about band members, a skewed history of the group, and see some old photos -- some of which showed us before gravity took its toll and we were a lot leaner. Anyway, check it out and if you have any requests for specific memories, let us know. We probably can't do anything about it, but let us know anyway -- it might make all of us feel better. Anyway, That's it for this e-blast from the past (and present). Next time we'll once again give you our Butch Whacks North Beach picks to click restaurant-wise for some pre-show sensory satiation. And you better know the band doesn't put its collective gourmet reputation on the line unless we're talking good eats and good value! This email was sent to localsports@earthlink.net by info@butchwhacks.com.